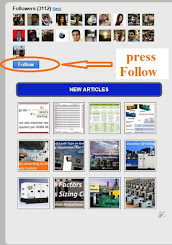 Introduction for Types of Motors/Compressors used in Air-Conditioning Systems. 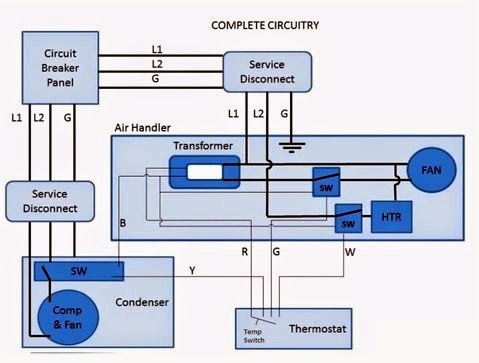 Today, I will explain Electrical Wiring for different Air-Conditioning Systems Types and Equipment. 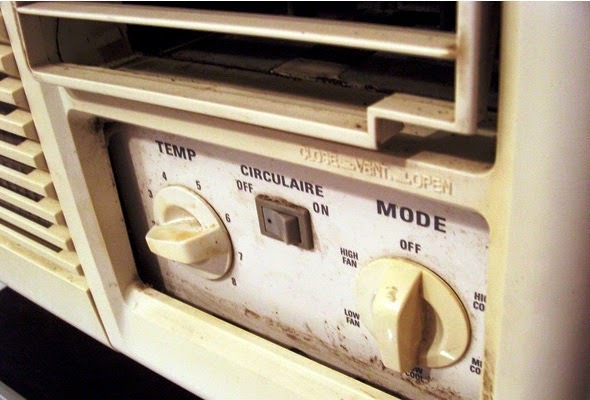 A rotating selector/Mode switch marked with a hot-cold scale of five positions (off, high cool, low cool, high fan, low fan) with no temperature settings. 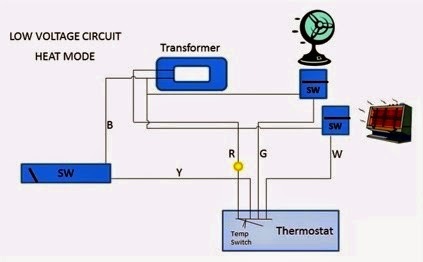 A rotating Thermostat switch work as on/off switch for the compressor, its status is depending on what temperature/cooling degree you set it at (usually there are 8 positions for cooling degree). Louvers swing switch: it is on/off switch which controls the swing motor responsible for controlling the movement and direction angle in which the air be supplied from the louvers to the room. 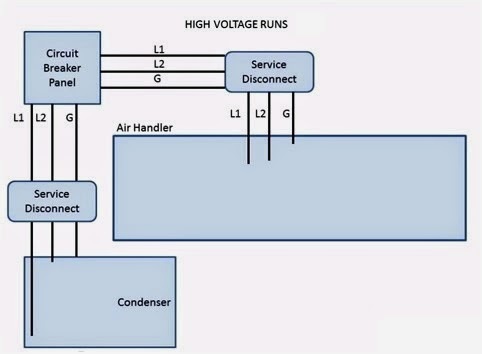 The Window air conditioning units are fed from single phase power source (see Fig.3), so its branch circuit and its main power cord consisting of 3 wires (The ground wire, hot wire and neutral wire). The branch circuit will originate from one of the single pole Overcurrent protective device OCPD included in an electrical panel. Then go through raceway system (conduits, ducts, …) to a disconnect means of some type suitable for the application . 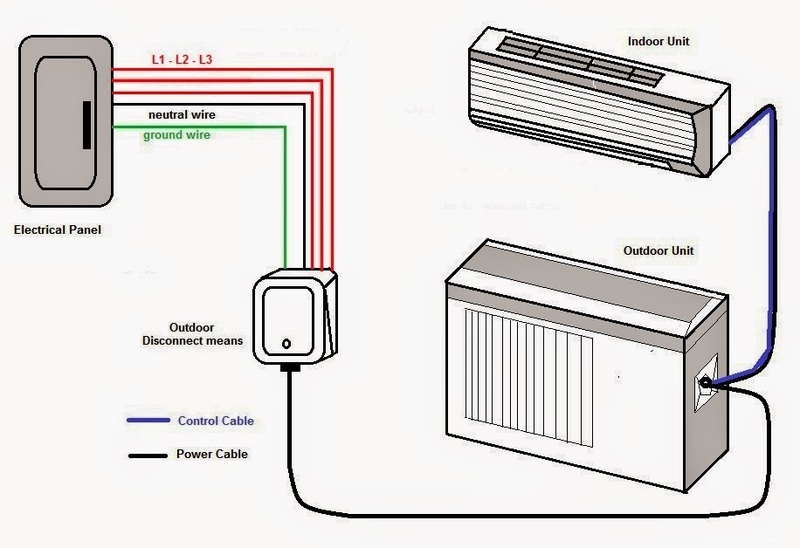 Finally, the main power cord of the Window air conditioning unit is connected to this disconnecting means from one side, the other side enters the casing of the unit to be connected to the unit’s terminal box. The ground wire (either green or a bare wire) is screwed to the metal casing of the unit. Hot wire to selector switch to fan motor. C- Neutral wire will be connected to fan motor and compressor without goes through any switch. 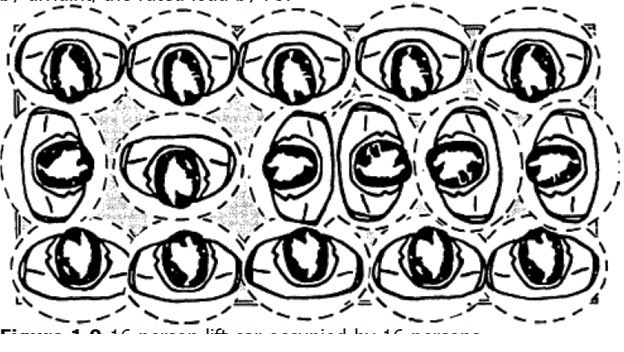 These connections are made on the wire connector in the back of the selector switch so, all neutral wires are common to each other because they are connected to the same point. 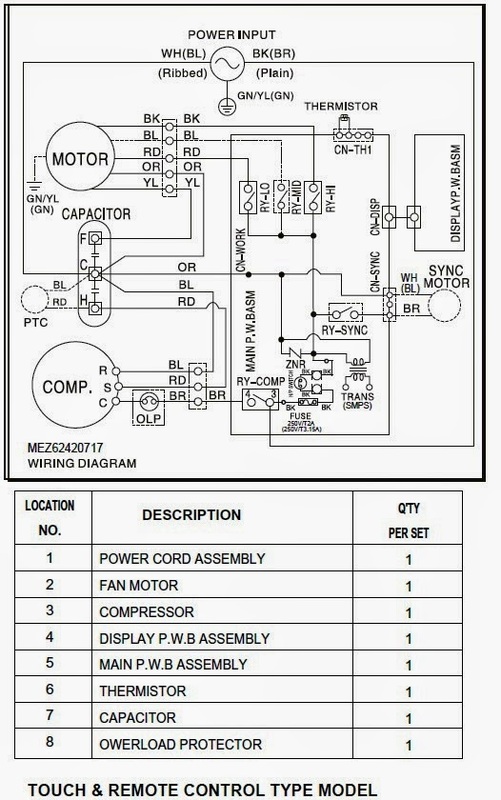 some examples for the complete electrical wiring diagrams for Window Air Conditioning Unit are in Fig.5. 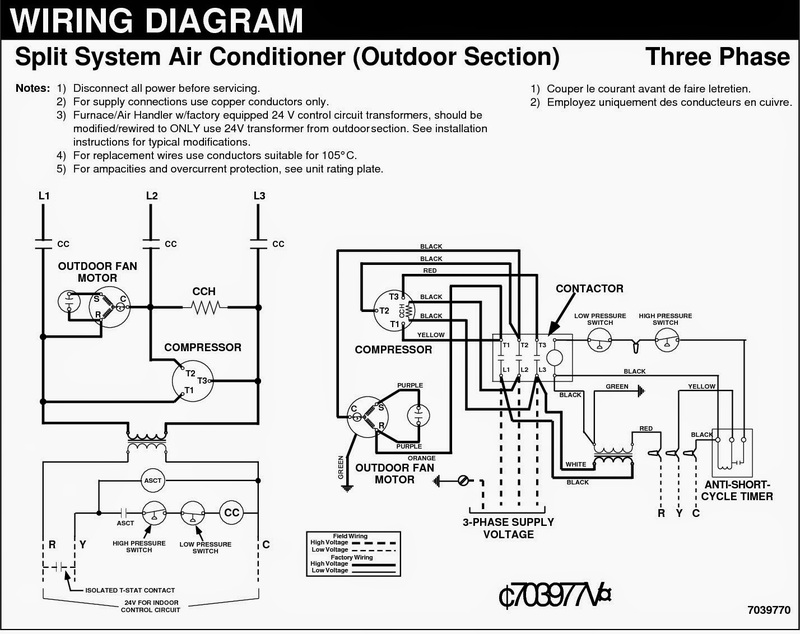 Also, in Fig.6, you can find examples for the complete wiring diagrams for Window Air Conditioning Unit which be mounted on the unit casing. 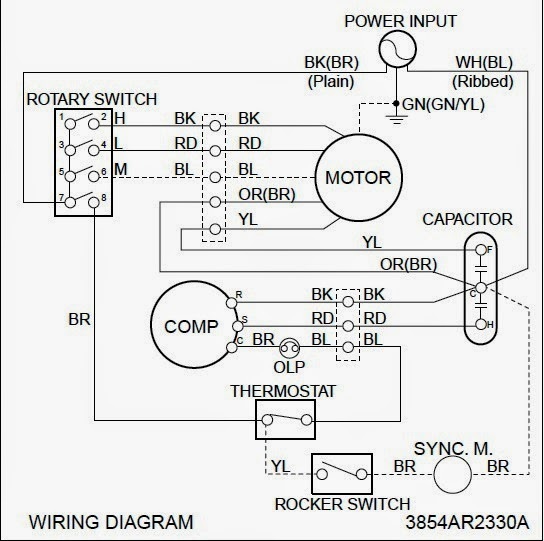 also, you can find examples for the complete wiring diagrams for Window Air Conditioning Unit, touch and remote control type in Fig.7. 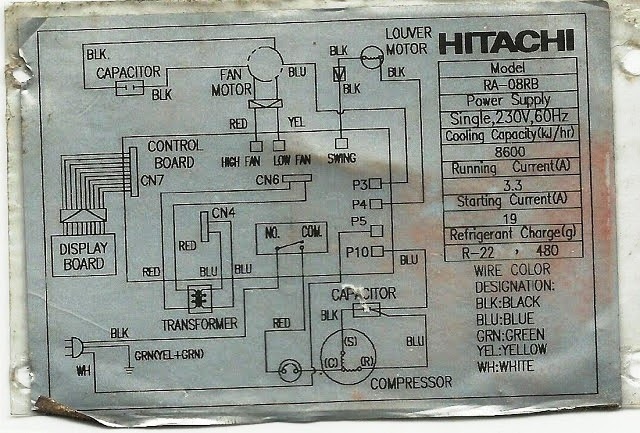 When you turn the selector switch to cool mode, the power that came in from the cord that connected to the selector via hot wire goes to the fan so the fan operates. 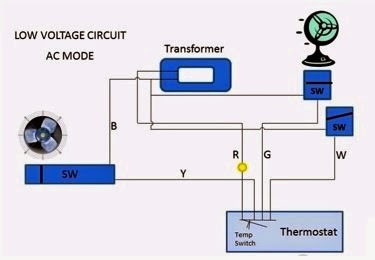 The selector switch also sends the power via hot wire to the compressor, but the compressor will not operate until the thermostat comes to the on position, then the compressor will operates and the cooling cycle begin. Single phase power source (see Fig.9 and Fig.11), so its branch circuit and its main power cord consisting of 3 wires (The ground wire, hot wire and neutral wire). 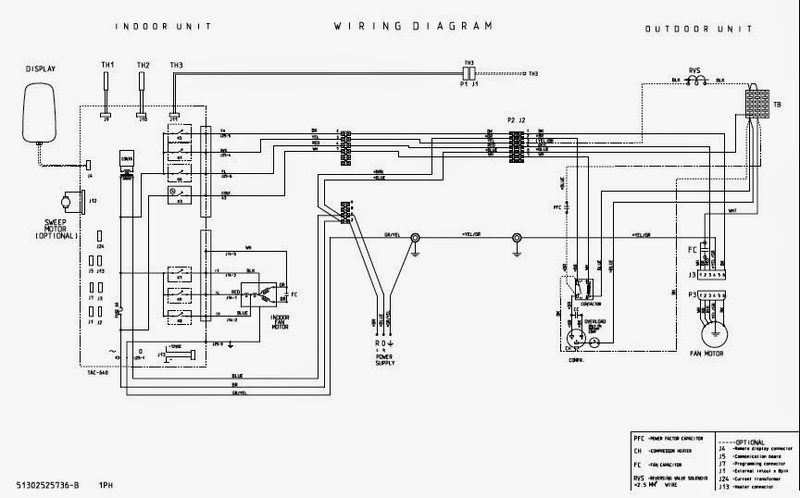 Three phase power source (see Fig.12), so its branch circuit and its main power cord consisting of 5 wires (The ground wire, 3 hot wires and neutral wire). The branch circuit will originate from one of the single pole/three pole Overcurrent protective device OCPD included in an electrical panel. Then go through raceway system (conduits, ducts, …) to a disconnect means of some type suitable for the application. After that, the main power cord of the split air conditioning unit is connected to this disconnecting means from one side, the other side is connected to the terminal box in the indoor unit (see Fig.9) or in the outdoor unit (see Fig.10)according to the manufacturer’s recommendations and wiring diagrams. 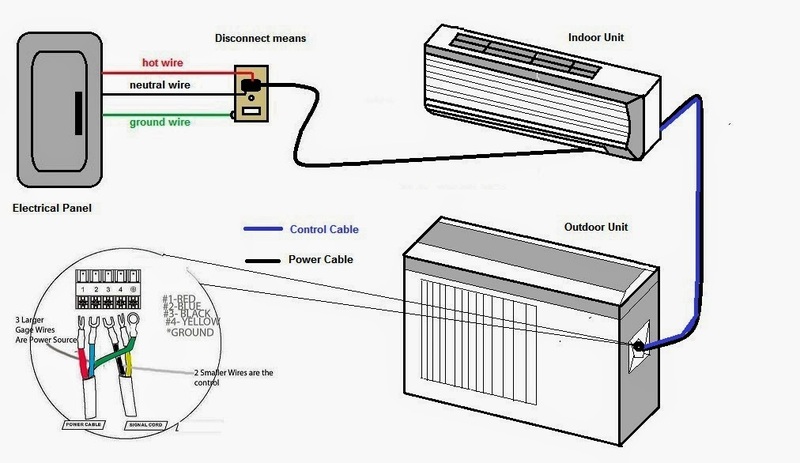 if power source connections made in indoor unit, an indoor disconnecting means is used and if power source connections made in outdoor unit, an outdoor disconnecting means (see Fig.14) with suitable identity of protection (IP) is used (review the manufacturer’s recommendations and wiring diagrams). 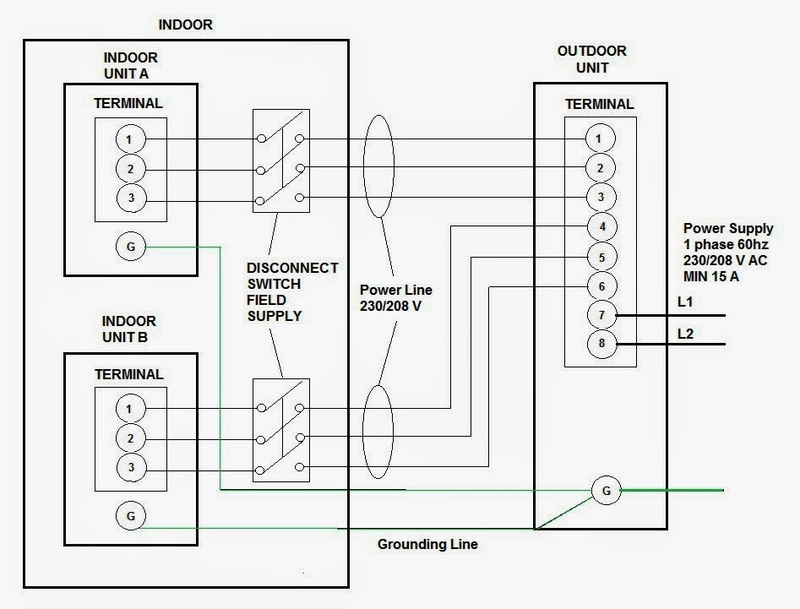 Finally, the power is transferred via 3-wire cable or 5-wire cable from the terminal box in indoor unit to the terminal box in outdoor unit or vice versa as indicated in the above point. There is a signal cable also connecting the control in the indoor unit with the control in the outdoor unit. The electrical wiring inside both of indoor and outdoor units is more complicated than that of window air conditioning units. 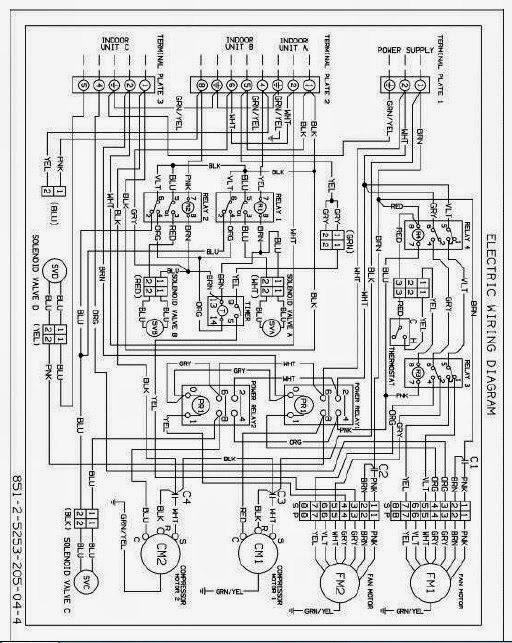 It is always factory wiring and from our point of view as electrical power engineers, it will not affect our work at all. 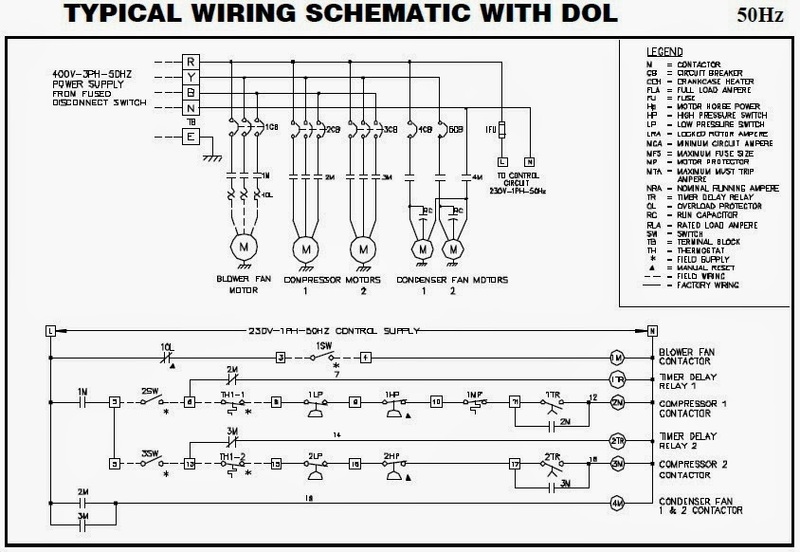 However, we provide some examples for the electrical wiring diagrams including control wiring for reference as in below Fig.15. 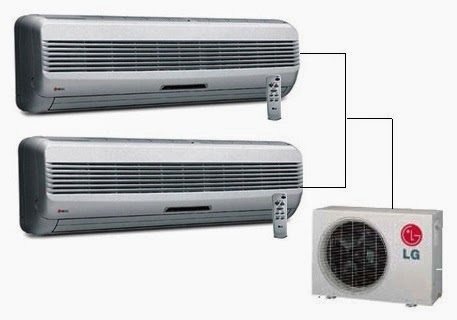 These days, Multi-split air conditioners are also being used commonly (see Fig.16). In units for one outdoor unit there are two indoor units which can be placed in two different rooms or at two different locations inside a large room. 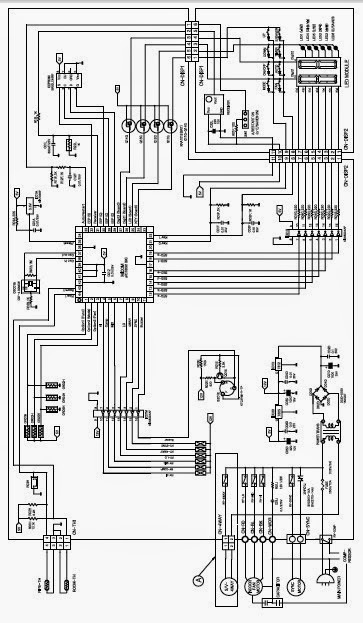 The power wiring for multi-split air conditioners will be as in Fig.17 below. 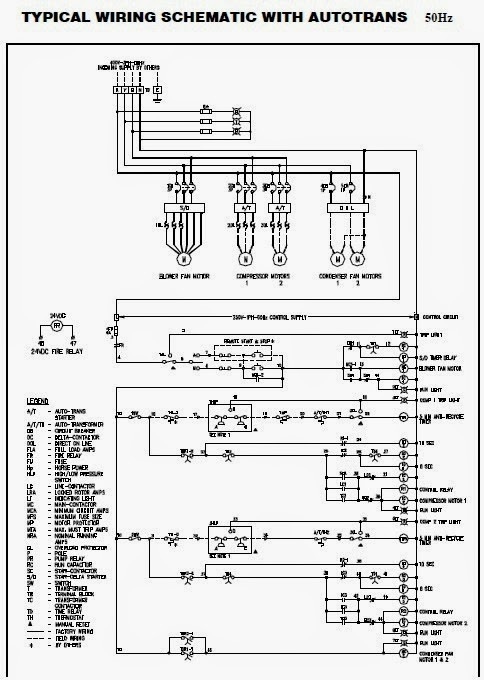 in Fig.18, you can find examples for the complete wiring diagrams for Multi-split air conditioners. The power wiring of Mini- Heat Pumps will look like that of the Split air Cooling Units for far extent (see Fig.19). 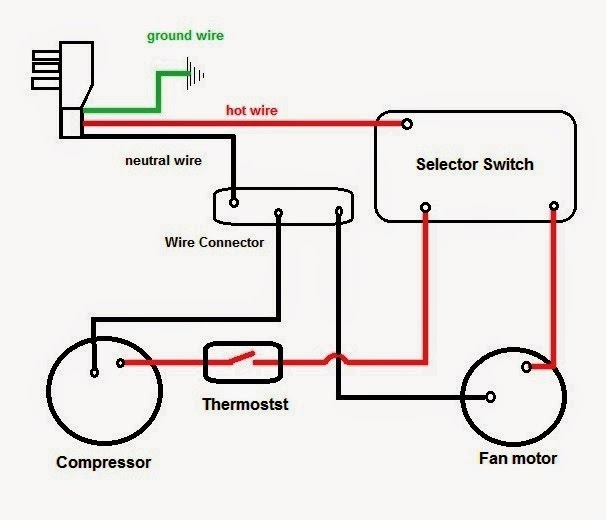 However, you can find in below some examples for wiring diagrams for Mini- Heat Pumps (see Fig.20) and you can compare them with that of Split air Cooling Units especially in the power (high voltage) wiring. The branch circuit will originate from one of the three pole Overcurrent protective device OCPD included in an electrical panel. 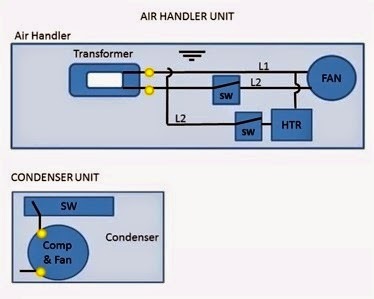 A disconnect means of outdoor unit (condenser/evaporator unit). This includes the high voltage wiring inside air handler unit and inside condenser/evaporator unit. Inside the air handler unit, the high voltage wiring powers the indoor fan, the heater and provide power for the transformer. Inside the condenser/evaporator unit, the high voltage wiring powers the outside fan and the compressor. Via the G wire to turn on the indoor fan. Via the W wire to turn on the heater. The thermostat usually have (5) positions which are Off – Cold – Auto – Heat – on. 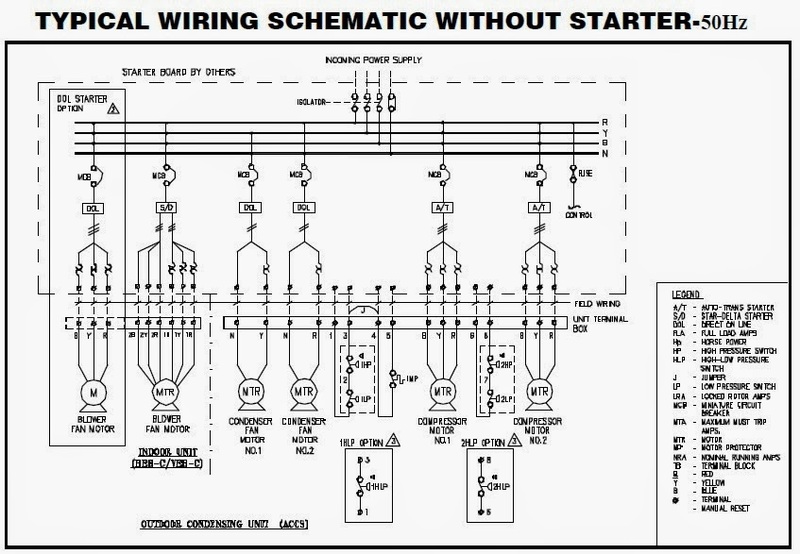 You can find in below some examples for wiring diagrams for split packaged units with different starting methods in Fig.27. Unitary packaged systems (see Fig.28) are by far the most commonly used air conditioning equipment in commercial buildings. 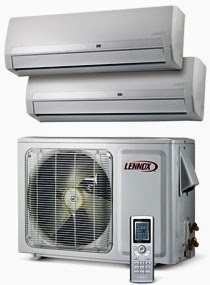 A packaged air conditioning unit is a self-contained air conditioner. It provides the cooling, heating and the motion of the air. All the components needed for cooling, heating, and air movement are assembled in a steel casing. Most packaged units use semi hermetic compressors which mean that the motor and compressor unit are mounted in one housing. Unitary Packaged units are packaged units which come as one single package that is ready to be mounted on a rooftop or on ground floor for some types. 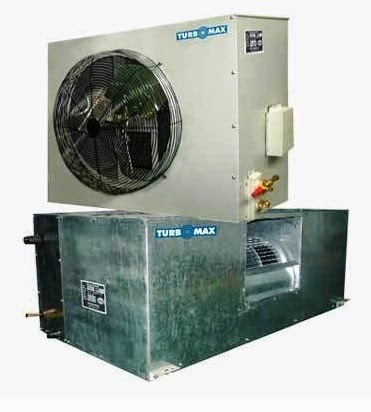 Rooftop packaged units can be classified according to the type of heating they supply. There are rooftop packed units with either electric heating or gas-fired heating. 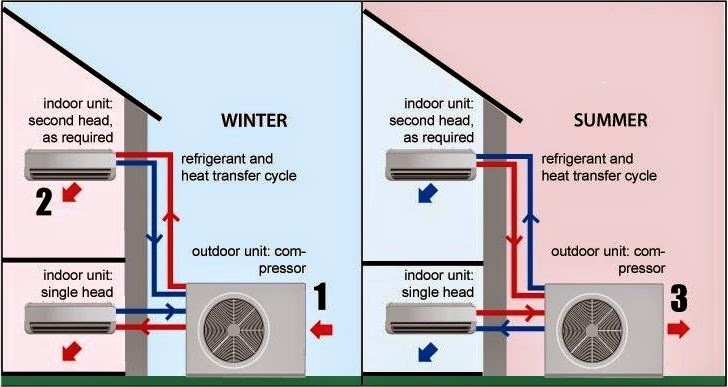 The heating can also be provided by a heat pump. However, electric heat and gas-fired furnaces are mainly used. The available cooling capacity of common packaged rooftop units ranges from 10 kW (3 tons) to 850 kW (241 tons). 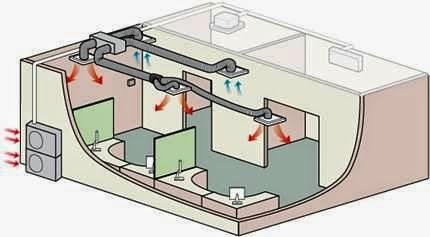 The air flow rate covers a range from 400 l/s (850 ft3/min) to 37,800 l/s (80,000 ft3/min). 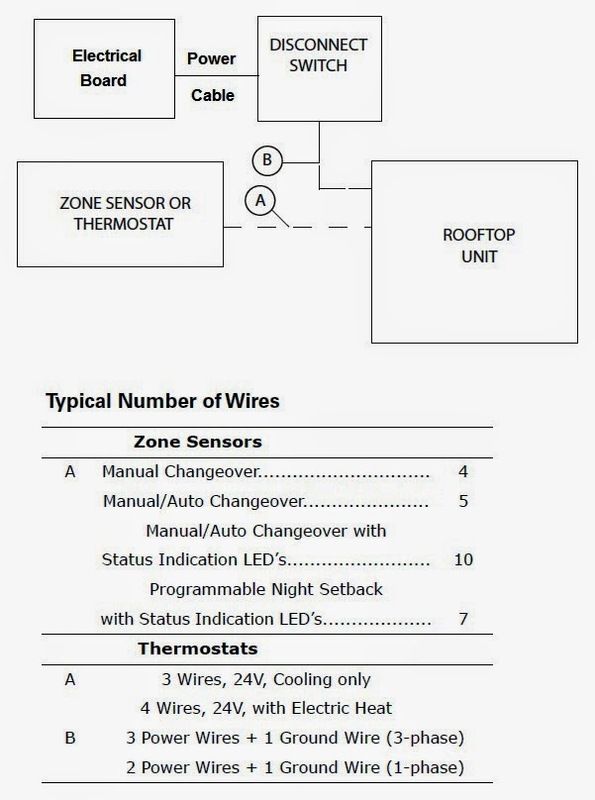 The power Schematic diagram for Rooftop packaged units is shown in Fig.29. 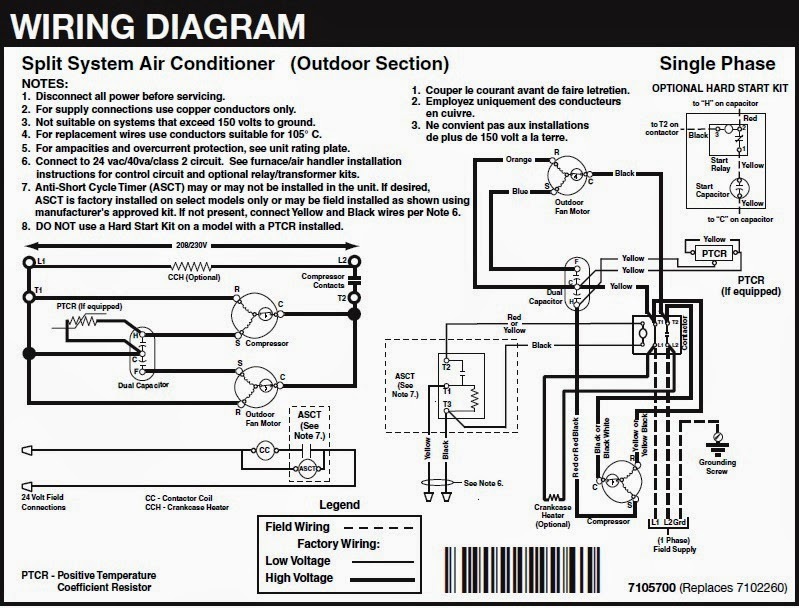 In the next Article, I will explain Electrical Wiring Diagrams for other Air-Conditioning Systems Equipment. So, please keep following.